Igloo Letterpress uses vintage plate to create frameable map of Worthington Love Worthington or know someone who does? Well, we've got the perfect holiday gift for you! Look no further than Igloo Letterpress where owner Allison Chapman is printing maps of Worthington from an original vintage plate—most likely from the 1950s or 1960s. 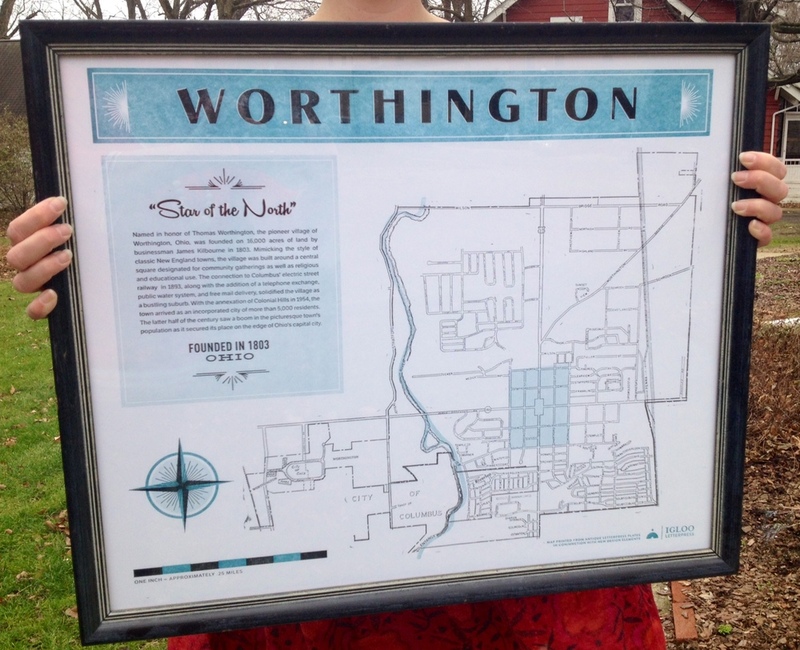 The printed maps generated a great deal of excitement during Worthington's recent Holiday Open House as visitors tried to locate their neighborhoods. "Rush Creek is there, so that helps us estimate the time period," Chapman said. "But other areas were not developed yet." A local business owner found the vintage plate in an antique store and then shared it with the folks at Igloo. But Chapman admits she'd been thinking about creating something like this for a while. Not only is she a self-professed lover of maps, but her husband used to work in a map store. Truth is, the timing could not have been better, considering that Igloo only recently acquired a press large enough for the job. "On its own, I didn't know that it was something our customers would want to hang. So we added some details to highlight the history of Worthington," Chapman said about the design work she and graphic designer Rachel Dangerfield added to the piece. "I wanted it to fit the mid-century feel, and we took that into consideration with the fonts we chose. We also highlighted the green space and the Olentangy River." Finding a vintage plate like this may be a letterpress owner's dream-come-true. But Chapman says her favorite thing is being able to combine the vintage plate with new plates. "We have the flexibility in our print shop to print the old and the new alongside each other," she said. "I like that process." The Worthington maps are available in a 20 X 24-inch frameable size at the Snow House Gift Shop (39 West New England Avenue) for $45. Chapman plans to make them available online as well at iglooletterpress.com. Igloo is a small but mighty letterpress and bookbinding studio, retail shop and commercial printer in Worthington. Learn more at iglooletterpress.com or call 614/787-5528. Stay up to date on the best of everything in and around Worthington by checking the event calendar at VisitWorthingtonOhio.com or "like" us on Facebook at Visit Worthington Ohio.